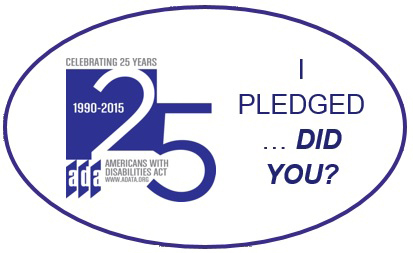 The Mid-Atlantic and Southeast ADA Centers took the lead on promoting the anniversary and the pledge drive nationally. Almost 9,000 entities (individuals, businesses and non-profits, and state and local governments) signed the pledge to recommit to the ADA goals. The Center developed an ADA timeline display for anniversary events around the Mid-Atlantic region. The Mid-Atlantic ADA Center created two new resources to enhance customer service and the accessibility of meetings, events and conferences. A 20 minute film titled “at your service” features individuals with disabilities discussing how they would like to be treated as customers. The film and short preview are available in English, Spanish, captioned and audio described versions. The Mid-Atlantic ADA Center provided in-person trainings for several groups in the region, including One Stop Centers in Virginia, the Virginia Independent Living Conference, the Leadership Exchange in Arts and Disabilities Conference, ADA coordinators in the state of Maryland, and the ADA Leadership Network. The greatest demand was for training on an overview of the ADA, Title II, and disability awareness. In June, the Center hosted a one-day conference called ADA In Focus Pennsylvania in Harrisburg. The conference drew 130 participants including state and local government employees, educators, and consumer advocates. Highlights included a plenary panel session featuring representatives from Federal agencies and a keynote address by C. Scott Wyatt of Carnegie-Mellon University. There were 12 breakout sessions on employment, access and design, Title II, and education. The Mid-Atlantic ADA Center expanded outreach in communities around the region by providing training, resources and networking opportunities to targeted groups. The Community Partners Network includes advocates and others who are active in their communities in sharing information about the ADA. The Title II Network consists of ADA coordinators and others in state and local government who work to ensure implementation of the ADA. Two new networks are the Corrections and Law Enforcement Network and the Transit Network, whose members share unique concerns in implementing the ADA. The Center’s ADA Leadership Network (ADA-LN) continued to expand in 2015. In 2015, 205 people from across the region participated in ADA-LN two-day Train-the-Trainer Seminars. These 205 trainers completed 40 in-person trainings, reaching an additional 550 people. Each ADA-LN trainer has access to the Northeast ADA Center’s 50 module curriculum, training support and advice, networking through quarterly trainings and an email listserv, as well as additional incentives. Trainers are supported to attend the Mid-Atlantic ADA Update Conference each September to further enhance their knowledge of the ADA. There were three ADA-LN Train-the-Trainer Seminars held in 2015. The second seminar was hosted by a major corporation, “corporate only”, and held March 31 - April 1. In August, the ADA-LN collaborated with Pennsylvania Office of Vocational Rehabilitation to build their capacity to partner with employers by training their Business Service Representatives. These trainers plan to offer the ADA and disability awareness training to businesses throughout Pennsylvania. In November, training was held for 15 new ADA-LN trainers.